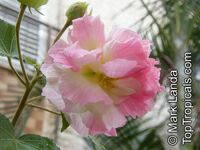 Hibiscus mutabilis - Kristi's Cotton Candy. Confederate Rose, Cotton Rose, Common Rose Mallow. The flowers open pure white and change color over a three-day period until they are deep pink and then as they die assume a dark "blue-pink" hue. The most notable characteristic of this flowering shrub is that flowers of three distinct colors appear on the bush simultaneously as the blooms color cycle independent of one another. This shrub thrives on regular watering but this is optional as it is very drought tolerant.